A judge has thrown out a lawsuit against gun manufacturer of the Bushmaster AR-15-style rifle used by Sandy Hook Elementary school gunman Adam Lanza in a massacre nearly four years ago that killed 26 people in Newtown, Connecticut. Superior Court Judge Barbara Bellis granted a motion by the North Carolina-based Remington Arms to dismiss the wrongful death lawsuit brought by the families of nine Sandy Hook victims. In her 54-page ruling, Bellis cited the Protection of Lawful Commerce in Arms Act, passed in 2005, which grants gun companies broad protection from civil lawsuits when their products are misused, like in crimes. Bellis did acknowledge that a “narrow exception” existed in the law for plaintiffs to hold the gun companies liable for “negligent entrustment,” a built-in exception for cases when companies carelessly sold their firearms to unfit buyers. But Bellis ruled to toss the lawsuit. “[T]he allegations in the present case do not fit within the common-law tort of negligent entrustment under well-established Connecticut law,” the judge wrote. The plaintiffs also couldn’t prevail under the Connecticut Unfair Trade Practices Act, the judge ruled. “A plaintiff under CUTPA must allege some kind of consumer, competitor, or other commercial relationship with a defendant, and the plaintiffs here have alleged no such relationship,” the judge wrote. Joshua Koskoff, a lawyer representing the victims’ families, said they will appeal the ruling, the Hartford Courant reported. Nearly a thousand mass shootings to have taken place since the Newtown shooting. For all of the discussion of what can be done to prevent future tragedies, little has changed. What can be done to stop the violence? Judy Woodruff talks with Todd Clear of the Rutgers School of Criminal Justice and Jeffrey Swanson of Duke University. Using a Bushmaster XM15-E2S made by Remington, 20-year-old Lanza shot and killed his mother before opening fire at the elementary school. There, Lanza killed 20 children and six teachers. He killed himself as police arrived. 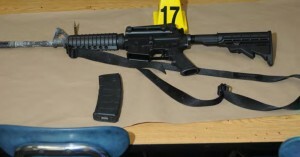 Lanza’s mother legally bought the semi-automatic rifle that was used in the December 2012, shooting. She purchased the gun at a Riverview Gun Sales store. Joshua Barajas is the deputy online editor for the NewsHour. He can be reached at jbarajas@newshour.org.